BIOPAC provides Smart Fabric chest straps for BioHarness and TEAM devices (Bluetooth or ISM devices) to fit most size subjects. BioHarness with AcqKnowledge software is a state-of-the-art lightweight portable biological Bluetooth data logger and telemetry system. It monitors, analyzes and records a variety of physiological parameters including ECG, respiration, posture, and acceleration. 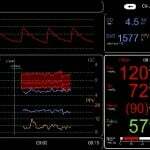 TEAM System stand-alone telemetry physiology monitoring systems provide simultaneous real-time physiological monitoring for multiple subjects across a wide area.